Streamlined customer service, just a click away. Zoho Desk provides intelligent automations for your team to deploy, so that they can respond faster and make every customer happier. Every business has a unique set of processes that are crucial to its functioning. In customer service, it could be as simple as assigning tickets to different teams, or a combination of creating tasks, assigning tickets and notifying decision-makers. Workflow automation can help you save time and increase efficiency by automating repetitive, manual actions. It's flexible, easy to configure and widely customizable to suit your business needs. In customer service, time is everything. A quick response and resolution can set your customer service effort apart from the rest. That means, you can't afford to lose track of pending tickets or responses. 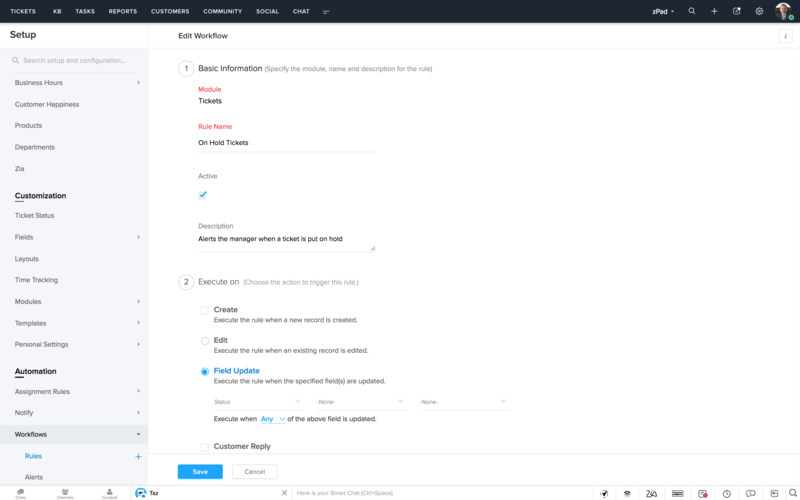 With time based rules, you can configure workflows to be triggered when a timed event occurs. For example, agents are notified when a ticket is pending for more than x hours, or when they've not viewed a response for x hours. Similarly, an email can be sent to supervisors if a ticket remains unassigned for more than x hours, or when an agent spends more than x hours in resolving it. Every ticket isn't the same, so the way you solve them is bound to differ. Workflows help you automate your basic customer service processes. But, for tickets that require a unique set of actions to be performed, macros can help. You can combine several actions like updating a field, sending an email alert and notifying the engineering team, in a single macro. Agents can decide where to apply them contextually, rather than have it standardized across all tickets.